Total household expenditure on Internet services reached, following a year-on-year increase of 10%, a figure of €643 million. Over 27 million individuals aged 10 or over have accessed the Internet at some time. 55.9% of Spanish households (9.5 million) are connected to the Internet. 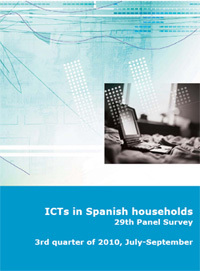 The expenditure by all Spanish households on ICT services was €3,463 million in the first quarter of 2010. Internet services accounted for 18.6% of the total expenditure on ICT. A total of 45% of Internet users who contacted the Public Administration via de Internet (e-Administration), did it to pay their taxes. Nine out of ten households have at least one mobile telephone, which means 15.3 million households.